In this in-depth study of Lesslie Newbigin's thought, George Hunsberger brings into clear view the "theology of cultural plurality" nascent in Newbigin's books and demonstrates its importance for the missiological enterprise today. Interacting closely with Newbigin's published and unpublished works, Hunsberger describes Newbigin's biblical rationale for the life and witness of the church in a culturally plural world. By teasing out Newbigin's thinking in this realm, Hunsberger gives shape to a theological area of inquiry and reflection badly needed for fruitful discussions of cross-cultural mission, religious pluralism, and ecumenism. 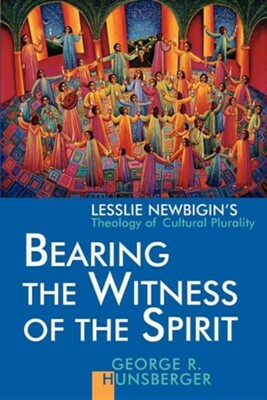 In this in-depth study of Lesslie Newbigin's thought, George Hunsberger brings into clear view the "theology of cultural plurality" developed in Newbigin's book and demonstrates its importance for the missiological enterprise today.Interacting closely with Newbigin's published and unpublished works, Hunsberger describes Newbigin's biblical rationale for the life and witness of the church in a culturally plural world. By teasing out Newbigin's thinking in this realm, Hunsberger gives shape to a theological area of inquiry and reflection badly needed for fruitful discussions of cross-cultural mission, religious pluralism, and ecumenism. I'm the author/artist and I want to review Bearing the Witness of the Spirit.